Enliven dishes with your favorite wines. Wine contains sugars, acids and tannins, and each of these will show up on the plate. Subtle characteristics, by contrast, normally disappear with cooking. To maintain balance, check your recipe for acidic ingredients like lemon juice or vinegar and cut back to make room for the acid in the wine. This is especially crucial when cooking with white wine. For delicate fish or vegetables, a dry non-oaked wine works best. 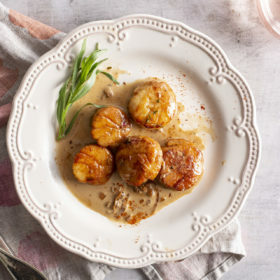 If your recipe is packed with onions, carrots and tomatoes, there will be plenty of sugars in the pot, so cooking with a fuller-bodied, less dry red or white wine can integrate perfectly. 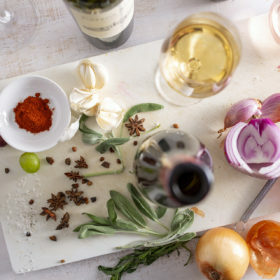 Use the type of wine you’d serve with dinner to make the dish. Even better, unless you’re pouring something rare or expensive, buy an extra bottle and cook with it. When you’re cooking with red wine, watch out for tannins. When concentrated in reduction sauces, they can become harsh. Fortunately, proteins found in meat and dairy declaw tannins like milk does tea. The Quality Consideration: You may be hesitant to cook with your most prized red wine but be careful not to use absolute plonk in your dishes. If you wouldn’t drink it on its own, do not cook with it! Cook with a basic bottle that you might enjoy in a casual setting. For deeper flavors, experiment with fortified wines like Port, Sherry, Madeira and Marsala. Michael Schachner offers some helpful tips and recipes on cooking with fortified wine in this piece.